US NEWS: Panasonic 3D TVs sell out in first week of sale | What Hi-Fi? The initial success in the US has raised optimism that the technology that helped Avatar break box office records could soon extend to living rooms and help boost the profits of the TV manufacturers, who have struggled with increasingly slim margins on standard flatscreen TVs as prices have dropped. Blockbuster 3D movies and sports event such as the 2010 World Cup are expected to drive demand for 3D sets, and today Sky has confirmed that its 3D TV channel will launch on April 3rd. 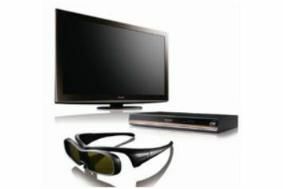 Virgin Media is also developing 3D TV, which it will demo at the Ideal Home Show in London this weekend. Panasonic was the first manufacturer to sell 3D sets in America on March 10th, with a 50in model bundled with a 3D Blu-ray player and a pair of 3D glasses selling for $3000 (£1960). • In a separate development, Marks & Spencer has today confirmed it will sell the Sony Bravia KDL-40LX903 3D TV with two pairs of 3D glasses included for £1999 from June 21st.